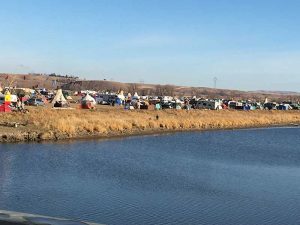 Dominican Women walked, stood, and prayed at the encampment next to the Cannonball River on the Standing Rock Reservation in North Dakota on Friday and Saturday (November 11-12). In support of our planet, especially our gift of water, they answered a call of the Standing Rock Sioux Nation to be in solidarity with all peoples around the world who suffer destructive violence brought upon them and the earth by ignorance and greed. 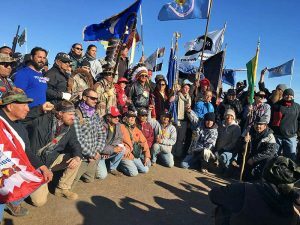 In a special way those at the encampment (and at four other sites in the area), numbering thousands of Indigenous People from the United States and around the world, are standing with the protectors of water against the forces of the Dakota Access Pipe Line moving across the country. They are joined by friends and supporters for long and short periods of time to witness to the power of prayer and ritual ceremony, acting in community for our Common Home, the planet, and the assurance of a future for our children and grandchildren. I represented the Las Casas board and was accompanied by a group from the Adrian Dominican Office of Justice, Peace and the Integrity of Creation. Traveling with sisters from Sinsinawa and Blauvelt, we arrived on a crisp morning and were warmly welcomed as we entered the campsite, given a place to park, directed to the Sacred Fire which burns day and night at the center of the site, and invited to join the procession going to the bridge over the Cannonball River for a ceremony honoring Veterans, especially Warrior Veterans. With the presentation of colors, the rifled salute, silence, praise and an honor song, the multi-generational group honored those who had given so much for our freedoms. Later we all gathered around the Sacred Fire where with song, dance and drumming we again offered thanks and could shake hands with those veterans present. 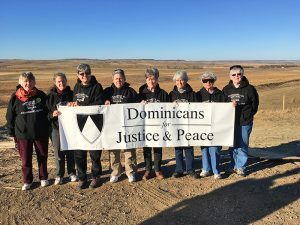 Many very moving and inspiring meetings and conversations took place as people saw our sweatshirts with the words “Dominican Sisters in Solidarity Water/Standing Rock.” We witnessed great care for one another at the site, people sharing their gifts and talents as the site accommodated singles and groups coming with tents, yurts, campers and homemade shelters joined the original band. Medical, mental health, legal aid, clothing, food tents, wood piles and various other areas of resources were set up. An art workshop area hosted volunteers making signs, banners, information and directional panels, and a large meeting dome dominated the space where people gathered each day for instruction and information on events and actions. Of profound inspiration to us were the opportunities to gather with others; participating in the Women’s Circle of the Sacred Pipe Ceremony, praying for the many needs of the world, to gathering with others to learn about the Medicine Wheel Ritual and Prayer that was being planned for Saturday in Bismarck. Many and diverse people expressed thanks to us for our prayer and presence with them and our promise of support as we left. We gratefully recall the moving experience of standing on Route 6 Saturday morning, blessing and waving on the caravan of dozens and dozens of cars heading for Bismarck and the Medicine Wheel Prayer as we headed to the camp to join those left behind in prayerful support. May our Creator Spirit bless those gathered as they continue their vigil of witness, prayer, peace and solidarity. Let us continue to pray with them.